Purpose: Dental hygiene education continues to move beyond mastery of content material and skill development to learning concepts that promote critical-thinking and problem-solving skills. The purpose of this research was to evaluate the effectiveness of collaborative learning and determine the growth in intellectual development of 54 first-year dental hygiene students. Methods: The control group used traditional pre-clinical teaching and the experimental group used collaborative pedagogy for instrument introduction. All students were subjected to a post-test evaluating their ability to apply the principles of instrumentation. Intellectual development was determined using pre- and post-tests based on the Perry Scheme of Intellectual Development. Student attitudes were assessed using daily Classroom Assessment Activities and an end-of-semester departmental course evaluation. Results: Findings indicated no significant difference between collaborative learning and traditional learning in achieving pre-clinical competence as evidenced by the students' ability to apply the principles of instrumentation. Advancement in intellectual development did not differ significantly between groups. Value added benefits of a collaborative learning environment as identified by the evaluation of student attitudes included decreased student reliance on authority, recognition of peers as legitimate sources of learning and increased self-confidence. A significant difference in student responses to daily classroom assessments was evident on the 5 days a collaborative learning environment was employed. Conclusion: Dental hygiene students involved in a pre-clinical collaborative learning environment are more responsible for their own learning and tend to have a more positive attitude toward the subject matter. Future studies evaluating collaborative learning in clinical dental hygiene education need to investigate the cost/benefit ratio of the value added outcomes of collaborative learning. The notion of improved learning is enhanced through the use of new pedagogies involving collaborative learning. Collaborative learning is an active learning approach that improves learning through student interaction. Increased student performance, as well as advancement in intellectual development, has been associated with the collaborative process of education.7-9 Students in this type of learning environment learn not only from course instructors but also from their peers. In commitment in relativism, individuals evolve in their thinking and gradually make a personal commitment as one establishes one's own identity. Initially, there is a coming to terms with one's commitments to a set of values, a career and spousal choice. The second aspect of this stage involves issues requiring an endpoint in ultimate commitment. This stage, with its relative positioning along the continuum, takes place later in life. It is clearly the longest stage in the Perry Scheme and lasts one's lifetime. The first 3 stages of the Perry Scheme are measurable throughout a student's college education. Therefore, for the purpose of this study, positioning along the first 3 stages was measured. The purpose of this study was to design, implement and evaluate the effects of a collaborative pre-clinical model (CPCM) in dental hygiene education on learning outcomes and on the enhancement of intellectual development. The collaborative learning model used in this research focused on the application of instrumentation principles to various instruments used in dental hygiene treatment as taught in a pre-clinical course in the dental hygiene program at Farmingdale State College, State University of New York. The pre-clinical course is taught in conjunction with a preventive oral health concepts lecture. Students work together in the pre-clinical course for 8 hours per week. Throughout the semester time is allotted for demonstration and mini lectures. The collaborative learning model replaced the instrument demonstration component of the pre-clinical course. Collaborative groups of 4 were established and student roles within the groups were based on the 4 principles of instrumentation (grasp, fulcrum, adaptation, stroke). These collaborative groups were utilized throughout the semester as various instruments were introduced. During these collaborative activities faculty acted as facilitators rather than authority figures encouraging open lines of communication. Figure 1 depicts the general communication flow within the suggested pre-clinical collaborative model. The traditional pedagogy, used as the control, followed a rote learning method of instrument introduction. In this approach, students gather around an instructor for a demonstration of instrument usage. These demonstrations took place throughout the semester as each new instrument was introduced. Following the demonstration students paired up and practiced on each other with direct 1-to-1 faculty supervision. The application of collaborative learning focused on the principles of instrumentation. New instruments were introduced 5 times throughout the semester, and students worked in small groups on clinical manikins to problem solve the application of instrumentation principles. To promote group interdependence each member within the learning group was responsible for 1 of the principles of instrumentation. Roles within the group were rotated on a regular basis to ensure complete learning of the principles. The activities consisted of 4 to 6 open-ended, short answer questions designed to facilitate critical thinking. The initial exercise focused on instrument design, indication for use, grasp, fulcrum, adaption, stroke and patient/operator positioning. Subsequent exercises asked students to problem solve the principles of instrumentation in comparison to each new instrument introduced. These activities acted as a problem solving guide while faculty were facilitators to redirect the student's thought process if they were unable to solve the problem. The pre-clinical post-test was designed to evaluate the students' ability to apply the principles of instrumentation to 3 unfamiliar instruments. The instruments used in the post-test included the Gracey 13/14, Gracey 9/10 and the Langer 17/18. The purpose for using unfamiliar instruments was to eliminate the possibility of memorization. In pre-clinical instrumentation, students often memorize instrument usage based on the number engraved on the instrument handle. This evaluation was directed at higher order thinking skills and asked the students to critically think, analyze and apply their pre-clinical knowledge. The practical instrumentation post-test was performed on a typodont during the last 2 weeks in the semester in a small classroom close by the clinic. Three unfamiliar instruments were presented to the students, who were then asked to determine how these instruments should be used according to the principles of instrumentation. Students were given approximately 15 minutes to complete the evaluation. The post-test evaluation was not part of the students' pre-clinical grade and had no bearing on student success in the course. Students were evaluated individually by an impartial examiner from New York University College of Dentistry who had no connection to the dental hygiene department at Farmingdale State College. The examiner was a dental hygienist who had experience in teaching and evaluating dental hygiene students in pre-clinical instrumentation. Scoring of the post-test involved direct observation and evaluation of instrumentation skill. Scores ranged from 0 to 4 for each stated criteria associated with the 4 principles of instrumentation. A score of 4 indicated that the student performed the stated criteria 90 to 100% of the time, a score of 3 indicated 80 to 90% achievement, a score of 2 indicated 70 to 80% achievement and a score of 1 indicated 60 to 70% achievement. Finally, a score of 0 indicated that the criteria were not met. Students were asked to complete the LEP pre-test on the first day of the fall semester. The instrument was a rating test that took 30 minutes to administer. Students were also given instruction on how to complete the MID essay as a take home assignment and to return the Essay AP the following class session. Both the LEP and MID were mailed to CSID for scoring. Scores are designed to measure patterns of longitudinal intellectual development across groups of students or as a pre-/post-evaluation of courses. During the last class session students in both groups were asked to complete the LEP and MID Essay Q post-tests. The post-tests were also mailed to CSID for scoring and reconciliation. Qualitative analysis was employed to analyze student perceptions of their pre-clinical experience using emerging themes. Written assessment of each class session was collected each day through daily classroom assessment activities adopted from Angelo and Cross20 and an end-of-semester evaluation consisting of open-ended and likert scale questions assessed students' final perceptions of the preclinical course. The pre-clinical post-test evaluated student ability to apply the principles of instrumentation to 3 unfamiliar instruments: Langer 17/18, Gracey 13/14 and Gracey 9/10. The Mann-Whitney statistical test was used to compare distributions between the collaborative and traditional groups (Table I). Findings demonstrated no statistically significant differences between groups for all instruments with respect to the variables of grasp, adaptation and stroke. The variable of fulcrum did not demonstrate a significant difference between groups for the Langer 17/18 and Gracey 13/14, however, a statistically significant difference for fulcrum was noted for the Gracey 9/10 (z=-1.96; p=0.05), indicating that students in the collaborative group applied the principle of fulcrum better than the traditional group. Data collected from the Likert scale portion of daily classroom assessment activities revealed no individual differences within student responses over the course of the semester, but overall group differences did exist for the clinic days in which the pre-clinical pedagogy was significantly different (Tables II, III and IV). As time progressed the 2 groups diverged in the proportion of students who found the pre-clinical sessions extremely clear, interesting and useful. There was a large difference in comparison to the beginning of the semester when the response rate was equal between groups. It appeared that the collaborative group perceived the pre-clinical sessions had greater clarity, were more interesting and more useful as compared to the traditional group. The Fisher's Exact test revealed a significant difference between groups as evidenced on session 5 for clarity (Fisher's Exact=0.008), sessions 4 and 5 for how interesting (Fisher's Exact=0.04 and 0.003, respectively) and usefulness on session 5 (Fisher's Exact=0.03). Student Attitudes Toward the Preclinical Learning Environment* – How Interesting was the Clinic Session? Coding themes generated from the open-ended portion of the classroom assessment activities revealed that 42% of students in the collaborative group, as compared to 0% of students in the traditional group, identified help from fellow students as an important part of the pre-clinical sessions. Also, 29% of students from the collaborative group and 62% of students in the traditional group identified help from the instructor as most helpful in clinic (Table V). Percentages of responses to each of the questions in the departmental end-of-semester course evaluation questionnaire indicated no significant difference between groups when the percentages were compared using the Fisher's Exact test. Although not statistically significant, meaningful results were obtained. Forty-six percent of students in the collaborative group, as compared to 22% in the traditional group, felt they learned the principles of instrumentation extremely well, while 57% of students in the collaborative group and 35% of students in the traditional group felt they strongly increased their commitment to the profession. Collaborative learning as an active learning approach did not promote intellectual development or improve learning outcome when compared to traditional pre-clinical teaching. However, it can be inferred from this investigation that the students' learning was not impeded by the use of collaborative learning. Although collaborative learning is a pedagogically sound alternative for traditional pre-clinical teaching in dental hygiene, critical thinking skills were not enhanced. Critical thinking is the ability to evaluate, make judgments and apply knowledge to meet a challenge presented by a new experience or situation. As revealed in this investigation, students were not able to apply the principles of instrumentation when presented with unfamiliar instruments. The pre-clinical post-test evaluation demonstrated that there was no significant difference between the groups except for the variable of fulcrum on the Gracey 9/10. The fact that students were unaware that the instruments evaluated in the post-test were different than the instruments used in their pre-clinical experience represents a limitation in this post-test design. Future studies should emphasize to the students that unfamiliar instruments would be present in the post-test evaluation. The advancement in intellectual development along Perry's Scheme did not differ significantly between a collaborative pre-clinical environment compared to a traditional environment. However, it is difficult to see change or advancement in intellectual development in dental hygiene education because traditionally there is a teaching-learning environmental pressure of emphatic reliance on mastering the “correct technique” in the development of pre-clinical skills. The demand of developing correct dental hygiene instrumentation technique lends itself to maintaining the characteristics of early multiplicity in the students' perception of the instructor being the source of the “right way” regardless of learning environment. Overall, students' perceptions and attitudes concerning pre-clinical dental hygiene education were the same for both groups, indicating that all students were satisfied with their pre-clinical experience. It was anticipated by the researchers that students in the collaborative group would feel more frustrated at the beginning of the semester because of the ambiguity of the collaborative learning process. However, results showed that students were receptive to the process. This may have been due to the fact that they knew they were participating in a research project, a limitation of the study. Although all students found their pre-clinical experience satisfactory, significant differences were noted in the students' responses to individual pre-clinical sessions associated with the introduction of new instruments. It was evident from the research that students in the collaborative group found the individual pre-clinical sessions that introduced new instruments to be more clear, useful and interesting than did students in the traditional group. It can be inferred that the reason there was no significant difference between groups is that both groups were clearly in the dualistic phase of development. As time progressed the collaborative group may have better acclimated to the challenge and support of a collaborative environment. It is important to note that these pre-clinical sessions represented the different pre-clinical pedagogies used in the study. Therefore, it can be inferred from these findings that dental hygiene students in the pre-clinical setting found the collaborative pedagogy to be beneficial. Lastly, students in both groups identified instructor assistance and practice time as important in the learning process. This is most likely related to the students' insecurity with learning a new skill in a new environment. However, students in the collaborative group also identified help from their peers as influential in their learning. As illustrated by a student responding to the daily classroom assessment activity, “listening and watching each other helped bring all the fundamentals together.” This finding was not apparent in the traditional group, suggesting that collaborative learning assisted students in recognizing their peers as legitimate sources of learning. Advancement in intellectual development was not significant in the collaborative group as compared to the traditional group. Perhaps the fact that collaborative pedagogy was employed only on the 5 days in which a new dental instrument was introduced may not have been enough collaborative intervention to foster intellectual growth. Although students were responsible for their own learning of the new scaling instrument they still perceived an emphasis on being perfect with their skill development. The pre-clinical environment might stifle intellectual development secondary to the nature of the discipline of clinical dental hygiene. Another observation was that the MID essay question on post-test may have been misinterpreted by the students. Although the essay asked the students to define their experience in this pre-clinical course, the responses reflected harsh opinions of the entire first semester of classes within the dental hygiene curriculum and not just the course under investigation. This may have been problematic in scoring the essay in rating them for proper Perry positions. The value added outcomes realized through the collaborative process are congruent with the work of Bruffee and Gamson who suggest that students involved in collaborative learning are more responsible for their own learning, tend to have a more positive attitude toward the subject matter, increase their tolerance for diversity of opinion, improve their interpersonal skills and enhance self-esteem.7,8,24 Future studies evaluating collaborative learning in clinical education need to investigate the cost/benefit ratio of these value added outcomes. Collaborative pedagogy in didactic and clinical course across the dental hygiene curriculum would provide the foundation to foster a shared community of learners. Laura J. Mueller-Joseph, RDH, EdD, is a professor and chairperson at the Department of Dental Hygiene and Acting Assistant Dean, The Theresa Patnode Santmann School of Health Sciences. Luisa Nappo-Dattoma, RDH, RD, EdD, is an associate professor at the Department of Dental Hygiene. Both are faculty at Farmingdale State College, State University of New York.
. Collaborative learning techniques. A handbook for college faculty. San Francisco (CA): Jossey-Bass Publishers; 2005.
. Dental education at the crossroads: Challenges and change. An Institute of Medicine Report. Washington DC: National Academy Press; 1995.
. Enhancing clinical competence using a collaborative education model. Phys Ther. 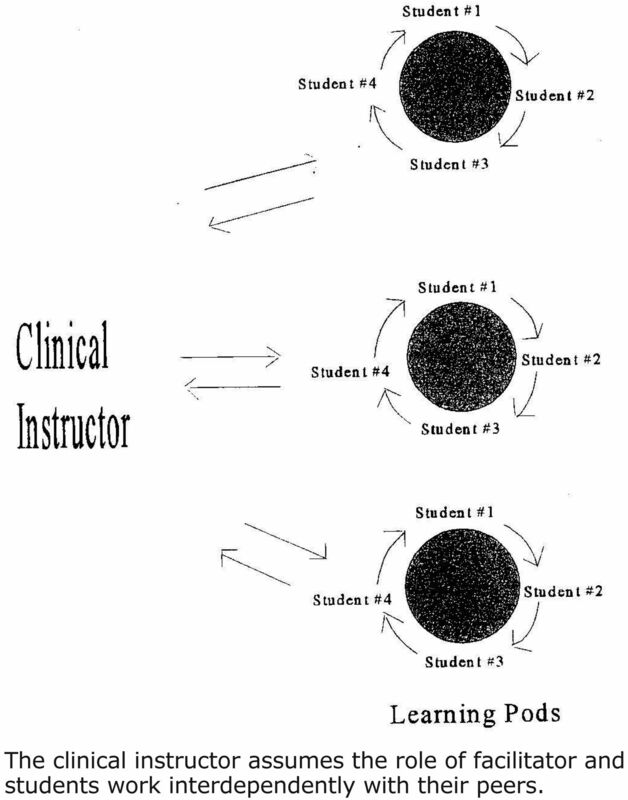 1993;73(10):683-697.
. College learning in radiography education. Rad Tech. 1994;65(5):299-303.
. Reciprocal learning among students in the clinical area. Nurs Educ. 1992;17(5):27-29.
. Collaborative learning. Higher education, interdependence, and authority of knowledge. 2nd ed. Baltimore (MD): John's Hopkins University Press; 1999.
. Sharing our toys: cooperative learning versus collaborative learning. Change. 1995;27(1):12-18.
. Restructuring registered nurse curricula. Nurse Educ. 1995;20(6):39-44.
. Does active learning work? A review of the research. J Engr Educ. 2004;93(3):223-231.
. The efficacy of collaborative learning groups in an undergraduate statistics course. Coll Teach. 2006;52(2):244-248.
. Evaluation of social interaction, task management, and trust among dental hygiene students in a collaborative learning environment. J Dent Educ. 2011;75(2):180-189.
. Forms of intellectual and ethical development in the college years: a scheme. Fort Worth (TX): HOH, Rinehart, & Winston; 1970.
. An assessment of the intellectual development of dental students. J of Dent Educ. 1997;61(10):781-786.
. Predictors of position of intellectual development in dental hygiene students and practitioners. J Dent Hyg. 1990;64(9):439-445.
. Assessment of a student/environment (developmental) match in an associate degree dental hygiene program. New York (NY): Teachers College, Columbia Univserity; 1995.
. Learning environment preferences: exploring the construct validity of the objective measures of the Perry scheme of intellectual development. J Coll Stud Dev. 1989;30(6):504-514.
. Developmental instruction: fostering intellectual and personal growth of college students. Minneapolis (MN): University of Minnesota; 1974.
. An evaluation of developmental instruction in a university setting. Minneapolis (MN): University of Minnesota; 1975.
. The measure of intellectual development: An instrument manual. Olympia (WA): Center for the Study of Intellectual Development; 1990.
. The learning environment preference: An instrumental manual. Olympia (WA): Center for the Study of Intellectual Development; 1990.
. Classroom assessment techniques. A handbook for college teachers. San Francisco (CA): Jossey-Bass Publishers; 1993.
. Collaborative learning comes of age. Change. 1994;26(5):44-49.